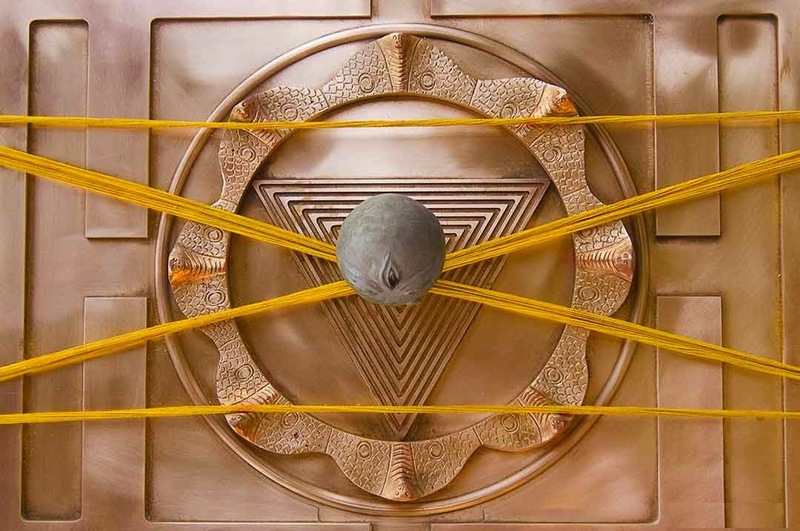 YANTRA literally means "support" and "instrument". A YANTRA is a geometric design acting as a highly efficient tool for contemplation, concentration and meditation. YANTRAS carry spiritual significance : there is a specific meaning that pertains to higher levels of consciousness. The YANTRA is like a microcosmic picture of the MACROCOSM. It is a focusing point and an outer and inner doorway. The YANTRAS are often focused on a specific deity and so. 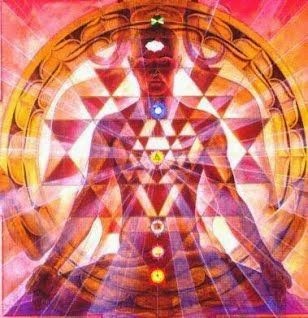 by tuning into the different YANTRAS you can tap into certain deities or creative force centers in the universe. The most celebrated YANTRA in India is the Sri YANTRA, the YANTRA of Tripura Sundari. It is a symbol of the entire cosmos that serves to remind the practitioner of the non difference between subject and object. When one focuses on a YANTRA, his mind is automatically "tuned in" by RESONANCE into the specific form energy of that YANTRA. The process of RESONANCE is then maintained and amplified. The YANTRA acts only as a "tune in" mechanism or a doorway. The subtle energy does not come from the YANTRA itself, but from the MACROCOSM. The core of the YANTRA is composed of one or several simple geometrical shapes : dots, lines, triangles, squares, circles and lotuses representing in different ways the subtle energies. For example the dot (BINDU) signifies the focalized energy and its intense concentration. It can be envisaged as a kind of energy deposit which can in turn radiate energy under other forms. The dot is usually surrounded by different surfaces, either a triangle, a hexagon, a circle etc. These forms depend on the characteristic of the deity or aspect represented by the YANTRA. In the tantric iconography, the dot is named BINDU; in tantra BINDU is symbolically considered to be SHIVA himself, the source of the whole creation. Between the simple geometrical elements that compose YANTRAS there is also the square (BHUPURA). The square is usually the exterior limit of the YANTRA and symbolically, it represents the element earth (PRITHIVI TATTVA). In conclusion, a YANTRA is a very complex spiritual instrument in the tantric practice (SADHANA). It can calm and focus the activities of the mind, and by its positive auto-suggestion it has a beneficent impact on the health and psychic well being of a person. As we showed above, the secret key to using YANTRAS in meditation is RESONANCE. The process of RESONANCE is established by mental focus on the image of the YANTRA. 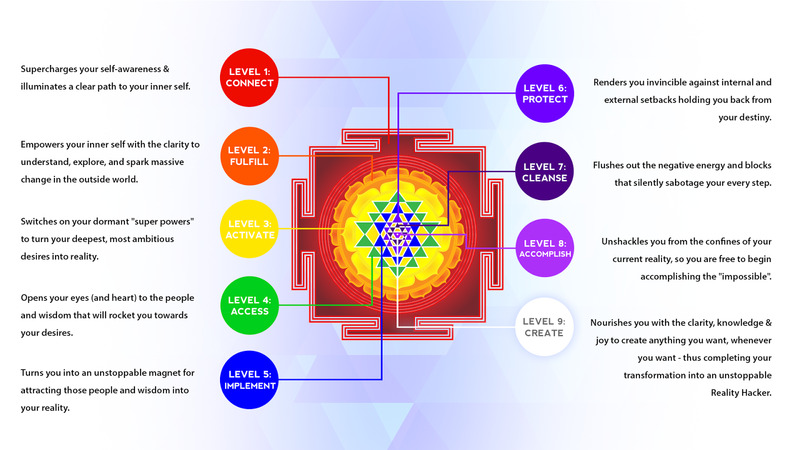 As long as the mind is tuned into the specific mood associated to that YANTRA, the energy flows, but when the RESONANCE is stopped, the energy disappears. 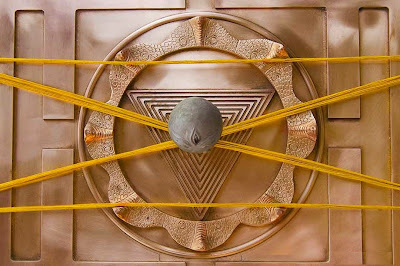 Hang the YANTRA on a wall facing North or East, placing the center of the YANTRA at the level of your eyes. Adopt your favorite posture or, if you want, sit on a chair maintaining your spine straight. Breath in through the nose and out through the mouth, but do not force at all, just let the breath flow normally. Look into the center of the YANTRA, trying to blink as rarely as possible; you don't want to look at the particular details of the YANTRA, just keep your sight right in the center and observe the whole YANTRA at once. In time, after at least seven days of YANTRA meditation you will be able to tap into the same yantric energy even without a YANTRA (at the beginning you may fix your sight on an exterior or imaginary point or evoke the YANTRA with your eyes closed). Do not forget to consecrate the fruits of this practice to God (karma yoga); you should not chase any objective when doing YANTRA meditation, just let it gradually guide you towards the sublime energies of the MACROCOSM. When executing this techniques it is recommended that we maintain a state of aspiration and intense longing for experiencing the beatific energies of the consciousness. It is necessary to understand that all yantras are instruments with existing enhancing potential. Although generally, yantras are well known for assisting in attracting desirable or favourable outcome, they cannot force something to happen or manifest that is against one's natural karma from preceding births or those created in this lifetime. 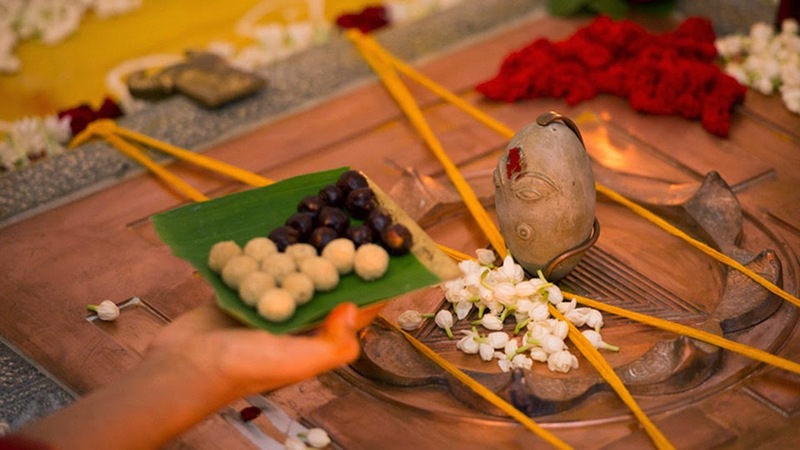 Outcomes of Yantra worship are largely governed by the aforementioned factors. For example, if it is not meant to be, one cannot force someone else to fall in love with you, can't force good luck or prosperity to happen at once. Everything has a season and a rhyme in the scheme of things in the universe. These usually unfold with time. Although sometimes what we wish for, may not happen but take heart that god and goddess always blesses with an outcome that is best for each individual. As universal parents, god and goddess, look over their earthly children in different ways and always with love. When things are meant to manifest for each of us through the use and worship of yantras, these sacred objects of respective resident Yantric deities will help speed up progress.